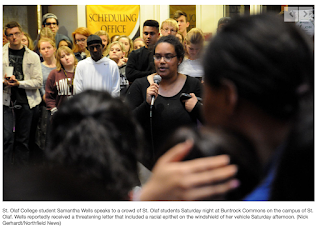 St. Olaf: Report of racist note on black student's windshield was 'fabricated'. School president made the revelation after first not disclosing the validity of the note but saying its author had confessed. Wells said that the anonymous typewritten note left on her windshield said in total: "I am so glad you are leaving soon. One less [N-word] this school has to deal with. You have spoken up too much. You will change nothing. Shut up or I will shut you up." Also Wednesday, Northfield police told the Star Tribune that they have closed their investigation into the note, explaining that Wells was unwilling to seek the filing of a criminal case. Wells said in an e-mail Friday to the lead investigator that "I have decided that I am not going to be filing a report." The student said she would be graduating soon, leaving for Europe in June and "would rather not spend the end of my college career and my last month and a half in the U.S. worrying about an investigation." With Wells' bowing out, police have closed the case and released their file on it. The file pointed out that police did not see the note because Wells "took [it] outside and had a 'ceremonial' burning to destroy it." Wells said she destroyed the note "because she didn't want to look at it or have it anywhere near her," the police file read.